I remember one day in grad school, I picked up an outdoor magazine, read through a few articles and thought "you know, I could do this." I'd been blogging for a while and had written a few short pieces for various websites. In hindsight, I was overconfident and completely naive to what goes into the process of writing an article from start to finish. That is kind of ironic, given that I had published papers in scientific journals, which can seem nearly impossible at times (*shifts eyes to reviewer #2*). Eventually, I caught a break, and despite fumbling along the way, I'll never forget holding a check from my first feature article. It was pretty surreal. My hope with this article is to make things easier for anyone out there trying to break into the outdoor writing world based on some of the lessons I've learned along the way. Prior to my first full piece, I contributed to a couple Kayak Angler Magazine articles, thanks in part to Drew Gregory and remaining in contact with Paul Lebowitz, then KAM editor and eventual founder of Kayak Fish Magazine. However, I wasn't a regular with KAM, and many emails to Paul never garnered a response. So, the first article ideas I ever proposed were to NC Sportsman Magazine. I sent 4 or 5 ideas in a bulleted list and attached my resume. In this case, the resume included some of my fishing accomplishments, my job at the time, and my educational background. Trust me, your ideas will carry a little more clout if you have a strong educational background combined with a strong fishing resume (e.g., guiding, tournament wins, etc.). I still take a similar approach when emailing new publishers/editors today, although I generally now annotate my article ideas. Specifically, I give a creative (at least, in my own eyes) title and a brief explanation of the key points of the article. The editor of NC Sportsman was very honest with me and told me that all of my ideas were too general and had been done. So, I threw one last idea at him - a destination piece for the Cape Fear River not far below Jordan Lake. The Cape Fear is a fairly well known catfish river, but the spotted bass (northern strain) fishery has exploded. The average size isn't great, but the numbers can be crazy. You could literally get tired of reeling them in. Given enough time, you could sort through the runts and find some nice fish, including some "citation size" specimens deemed trophies by the NC Wildlife Resources Commission. He said that idea sounded perfect and sent me the writer guidelines. Based on the format of NC Sportsman, the article required a certain number of photos, a couple text boxes with specific info, and minimum and maximum word counts. It didn't take long to outline the article, and I knew I would easily hit the required word count. However, I remember being given a deadline of "late August". Although I bugged the editor with a number of questions, I never asked for a specific deadline. That was a mistake. In late August, the article was about 70% done, and I was in Wyoming on vacation. After being in the mountains without cell service for a few days, we drove into town where I got the email "Hey, Drew. I really need that article by Friday." It was Friday morning. Thankfully, I had my computer with me and was able to eventually track down an internet connection. I was extremely stressed, but the rest of the group was understanding and we shifted our plans around so that I could finish writing. Trust me, you don't want to email a dozen photos at borderline dial-up speed to meet a last-minute deadline while on vacation. I was pretty embarrassed at the time, although now, I know that editors deal with those situations all the time. A few months later, the magazine hit news stands. At the time, NCangler.com had very popular forums that I regularly visited and contributed to. I had a lot of folks online congratulating and complimenting me, including people I didn't know. I also had some people who weren't as positive. If you write enough, you'll quickly find that you'll have some haters, mainly for really dumb reasons. Ignore them. Most of the time, even responding isn't worth your time. After contributing to a few more articles, I was yearning to write another long piece. As I began to plan the BASS Slam, the wheels started turning for an article. We had already planned on documenting everything with photos and videos. Why not pitch the idea to KAM? Paul L. had moved on from KAM, so I emailed Rapid Media founder and publisher Scott MacGregor. Probably two months went by with no response. Then, one day I get an email back from Scott completely out of the blue. "Sorry for the delay. We are actually sitting down Thursday to discuss some feature article ideas. This sounds perfect. I'll be in touch." Talk about a swing of emotions. I went from disappointment to happiness and nervous excitement in four short sentences. That Friday, I got an email from Ric Burnley, the new head editor. The article was a go. This time, I asked about the deadline, and I had the article finished and submitted to Ric about a month early. I'll never forget the call I got from Ric around 10 AM on Thanksgiving morning. "Hey, Drew. I'm trying to squeeze a little work in today because the publishers really want some finished content for the next issue. Since your article looks pretty good, it would be huge if I could send it over to them. Do you think we could chat some time today?" Turkey baster in hand, my first thought was that I had no idea how my now wife would take my answer, so I whispered "Yes. Can I call you back in a couple hours?" I finished preparing different dishes, jammed as much as I could in the oven, and stepped out on the porch to call Ric. We hammered out some final details as I paced the porch and driveway. I was still on cloud nine about everything, and Mary May could see that. She took the whole thing in stride, and I didn't even burn anything. That was the start of a really good working relationship with Ric, as well as Ben Duchesney, who was the KAM web editor. For the next couple years, I wrote/compiled at least one article in every KAM issue. Eventually, life got crazy for me when I moved, got married, switched jobs, and had kids. As a result, my writing slowed down. I did find that online magazines and publications were easier to write for because many are more lax than print media. I wrote a few articles for The Fisherman's Journal, Kayak Bass Fishing Magazine, KAM online, and others. I also got the chance to contribute to a kayak fly fishing book that Ben wrote. Now, I still enjoy penning an article for print when the opportunity presents itself, but I am also happy to focus on my blog and the Wilderness Systems blog. So, what are the some of the biggest things I've learned along the way? 1) Know the writing guidelines. Sometimes, an editor will send them to you. Other times, they may be posted online. Some magazines might not have any, but in those cases, and really in most cases, go back and look at past issues. Not only can you get an idea for the style and content of the specific publication, but you can also see what has been done and what types of articles they typically run. 2) Be a good and flexible communicator. If an editor emails or calls you, expect that they want a fairly quick answer. If you contact them, know that it may take the better part of a week to hear back. Also, don't overcommunicate. No-one wants to hold your hand through the process. That is a good way to not have article ideas accepted in the future. 3) Give credit where credit is due. This goes for photos taken by others, help you've been given in compiling an article, or maybe a tip on a hot bite. Not giving a quick shoutout to someone who deserves it is a good way to burn a bridge. 4) Don't be late. If you can, please be early. I say that as someone who compiled a number of "multiple expert" pieces when working with KAM. Nothing is worse than the folks who constantly say "I'll have it you soon" and then fail to follow through. I fully suspect delays at times and deadline shuffles, but the chronic procrastinators can make it tough. For me, no matter how good your content is, failure to follow through makes me want to not work with you again. Editors feel the same way. It is almost a one strike and you're out system. I've even had folks tell me for months that they'll have a piece done by the end of the week and then on the day the content is due, have them tell me they can't do it at all. That is an automatic blacklist in my book. It is also a good reason to always have one or two go-to contributors in your back pocket who you know can get you solid content in less than 24 hours. 5) Be prepared to work with a wide variety of people, some of whom are very different than you and may not be easy to work with. If you are a writer, you likely have a distinct style. I certainly do. Well, so do various editors, publishers, other writers, etc. Know that you may have to concede some of your style to get an article to print. In fact, I've seen words and even sentences changed between the "final edit" and "print edition" that introduced errors into the article. I've seen misprints. I've seen things I didn't say attributed to me. These things will happen. Sometimes, it can be awkward, but it is part of the business, so be prepared. You'll eventually end up working with folks that aren't always easy or fun to work with. Taking that in stride is part of being a writer and an outdoor professional. 6) Manage your word count. One of the worst feelings as an editor or author of a multi-contributor article is to give someone a word count or word count range only to receive their article/contribution and have it be way over that count. I think a lot of folks believe that more info is better, but that isn't true. As a writer, you need to be able to concisely tell your audience what you want to say. If additional details are needed, trust me, someone will be in touch. Going over a word count is just creating more work for editors and publishers, and it is generally frowned upon. 7) Don't write with an accent. This is two-fold. First, we all have a tendency to write the way we talk. That can be troublesome for a variety of reasons, and the biggest, in my opinion, is that you may not get taken seriously. My goal is to always sounds like a professional writer and to slant my style toward the publication I am writing for while still maintaining my individual voice. Additionally, trying to really lay on an accent can be a real turn off. A little southern charm can go a long way, as could a couple well placed "eh"s from a Canadian author, but moderation is often key. 8) Take a lot of good photos. You are going to want a lot of high-quality photos for a variety of reasons. First, you generally get paid well for photos. The "stock photo" market is super competitive, but in an article, if you have good photos, they are almost guaranteed to get printed. That is a win on so many levels - less effort, more money, face time with a broad audience, etc. Also know that you'll have a lot of photos that you think are good get rejected for various reasons. If you aren't great at taking photos, make friends with a couple folks who are and who are reliable and easy to work with. All too often, a great conceptual article will go nowhere without the right photos. 9) Get good at taking stock photos. These photos may be pre-launch rigging shots, drone pics, release shots, etc. Not every picture should be a "grip and grin", trophy fish, or sunset. However, don't get too far and start staging everything. Trust me, there are writers out there who stage the large majority of their photos. I will never forget shooting some marketing material with my buddy Bill Kohls one day when he caught a bass that absolutely inhaled one of the crankbaits we were covering. The bait was way down in the fishes throat. He took a quick cell phone picture and and sent it to a company rep who is a regular on the FLW tour. The response he got was "Sweet. Real or fake?" That was a startling realization for us because at the time, we were pretty naive to the ways of marketing and sales in the outdoor industry. So, be real, but don't overlook the little stuff. 10) Find something that makes you unique/stand out. Honestly, one of the biggest things that helped me get noticed was my Duke degree. As soon as they see that, most editors know I will send them something in good shape, and that goes a long way, as every editor has opened the first draft of an article and immediately felt a few hairs go grey. Find ways to be creative, think outside the box, and be different while defining your own style. No matter how good you are at fishing style "x" or catching species "y", in all likelihood, so are thousands of other anglers. How can you frame these topics to make them more interesting than what the average guy has to say? It may be that you need to be more specific. 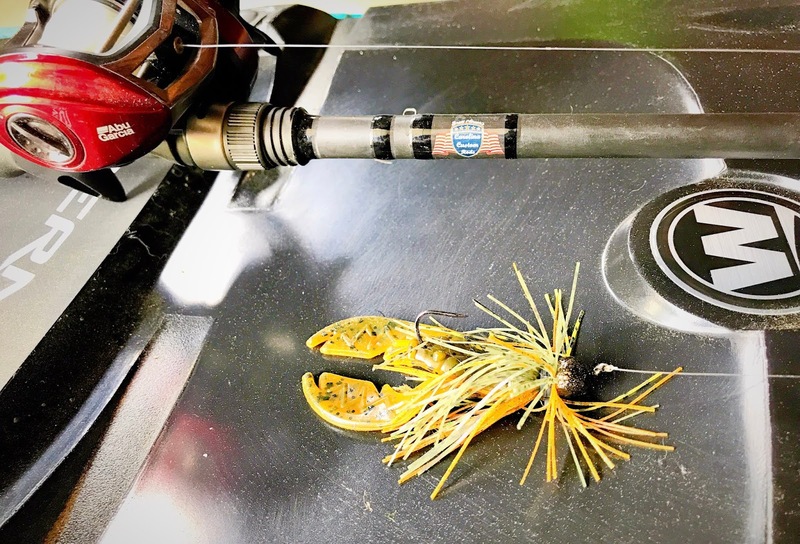 For instance, instead of "chucking big swimbaits for giant bass", you may write "chucking big swimbaits along intermediate grass lines to catch bass moving up to spawn as water levels rise in the spring due to cold snowmelt runoff." In other cases, you may need to be more general. For example, instead of "chucking big swimbaits for giant bass", you may write "chucking big swimbaits for giant bass - favorite techniques from the top pros in Texas, California, and Florida". I once wrote kayak fishing fitness article with a paragraph about the benefits of microwaving vegetables - true story. Articles don't always have to be super technical. Have a killer recipe (such as smoked rainbow trout) stashed away? Don't be afraid to throw it out there as an article idea. 11) Be prepared to sacrifice a fishing spot. The easiest way to get published is to write a destination piece, which is why most of the destination pieces you see written are about big, diverse bodies of water. At times, certain editors will be OK with something like "small lakes in central North Carolina." Other times, they want names, and if the article gets published, those spots will get a bit more crowded. 12) Know your weaknesses and embrace feedback. On multiple occasions, I've given Ric Burnley's email to an aspiring writer after talking with them and knew that they weren't going to get their ideas published. However, don't let that deter you. Being told no can help you pinpoint what you can change to be a better writer, and a lot of times, just contacting folks can help you get a foot in the door. Editors get dozens of emails every issue, many with the same topics, especially if a certain lure, technique, boat, etc. is hot at the time. Getting rejected is part of the process. Additionally, if you do get published, be open to any feedback you may receive from other writers, editors, publishers, etc. - but generally avoid feedback from the peanut gallery of social media. 13) Collaborate with link-minded folks who will co-sacrifice. It isn't always easy to find fishing buddies who can take good photos and are willing to sacrifice large chunks of fishing time to chase the perfect shot, especially without pay. In an ideal situation, you can find a fishing buddy who is willing to trade off between photographing and being photographed. Then, if a photo gets printed or an article you wrote together gets published, split the pay. 14) Good anglers don't necessarily make good writers. Some of my favorite writers aren't superb anglers. Don't get me wrong, they can more than hold their own, but they aren't usually the guys holding up the big checks or wrapping their trucks and kayaks. The best writers are experts that are relatable, informative, detailed and humble. In some cases, outdoor writing doesn't even have to be overly technical. Plenty of well-known writers pen funny outdoor stories and anecdotes for a living. 15) Consider online media. As I noted above, getting published online is generally easier than it is for a print magazine. In fact, I've turned in a few rushed articles that I am not overly proud of to online publishers. However, in today's social media craze, an online article might actually get your more publicity than a print article, although I think there is still more esteem associated with print. 16) Don't be afraid to submit. Again, the worst you will hear is "no". Additionally, a lot of magazines are constantly struggling to fill certain spots. Identify those needs and take advantage. For example, the "Grip 'n Grin" section of KAM is almost always in need of photos, and anyone can submit. I remembering submitting this photo and brief caption to Bassmaster thinking I'd be incredibly lucky to be selected for their "Best of Fall" album. Not only was the photo (taken by Jerry Li) selected, it was the album cover and got my shoutouts on the Bassmaster social media accounts. 17) Be prepared for your idea to show up without your name on it. On multiple occasions, I've submitted a list of article ideas to a magazine and had one (or more) accepted. Then, when the magazine was released, I stumbled upon another article that I conceived but didn't write. I'm not talking something general or even mildly specific. These were extremely specific topics. Unfortunately, this is one of the ugly sides of the industry. Every article covered in house means lower expenses for the publisher, especially on long feature articles with lots of photos. As a writer, it is probably the toughest thing to have happen because you are torn between understanding it as part of the business and feeling betrayed that your idea was essentially stolen. 18) Network yourself. Talk to other folks in the industry and let them know that you are interested in writing and/or contributing. Most people are more than willing to help however they can, without some of the competitiveness and jealousy that exists in other parts of the industry. 19) Develop a resume. Resumes are time consuming, especially because they require regular updating, but they are extremely handy in the outdoor world. Keep them short and sweet (one page, front only) and tweak them based on the target magazine or article. Include your fishing accomplishments, educational background, job, and any previous writing, web, or media experience. 20) Don't forget English 101. When penning an article, go through the basic steps in writing that you were taught in high school. Come up with a title, make an outline, write a draft, proofread the draft, have someone else proofread the draft, make final changes, check the details (word count, repetition, conciseness, etc. ), and submit the final article. 21) Keep a list. I keep a running list of blog/article ideas in my phone because if I don't I'll forget half of what I wanted to write about. I include a brief title and a few notes about each subject. I'll randomly add to these notes and use them to help outline the structure of an article. I have been extremely fortunate to work with a lot of different editors, writers, and anglers over the years. If you managed to read this far, I want to say thank you to you all. You've helped shape my life in many ways, and I hope the memories and advice blogged here can help others in their journeys. Also, if you are reading this and have something to add to this list, please let me know. I would be happy to add the info to the blog (and give you credit, of course). This blog is a bit of a follow up from the last one. In outlining it, I realized that I am borderline slipping into the Fish Strong realm with this post. For those of you who remember that site, it had a slight Randy Flowers feel, but with some actual substance. Specifically, if you can find it, there was an "unboxing" troll video that was an absolute classic. Anyway, back on topic, let's talk a little about the ever popular personal Facebook fishing page. 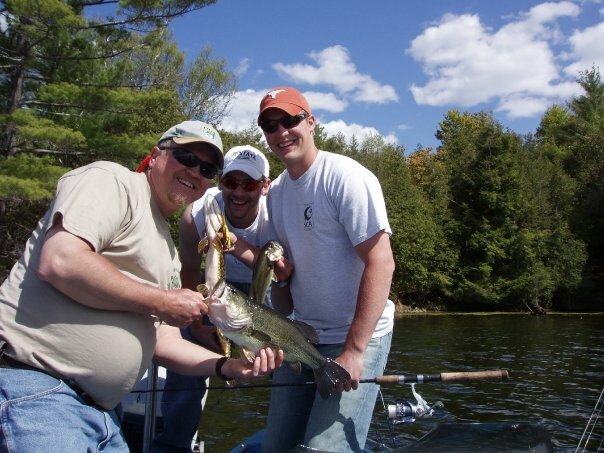 As a dedication to Facebook fishing, all the photos in this blog will be fishing throwbacks I dug out of old FB albums. If you are an angler reading this and have your own Facebook fishing page, you can likely scroll through your follower list and not find my name. When such pages first became a thing a number of years ago, I quickly realized that the bulk of the content on those pages was purely promotional. It was a way of spamming a select audience. In a way, those pages did me a favor. I already have enough posts to scroll through and ignore in my feed (I'm looking a you, non-stop politics guy). Plus, I found that the really interesting stuff found its way onto my feed anyway. Don't take it personally. I don't have one of those pages, and I don't even follow the pages of some of my good friends - anglers I talk to on a regular basis. Off the top of my head, I can only think of three fishing pages I closely follow on Facebook, and one of those started as a pseudo-personal page and has morphed into an international gem. Those three sites are Tactical Bassin, Jeff Little's pages (he has/had a few), and Juan Veruete's pages. These three break down skills, techniques, gear, etc. in a very detailed and informative manner. They talk about experimenting and trial and error. Really, they provide promotional info in a non-promotional way that makes me want to buy stuff, except a Torqeedo, sorry Jeff. 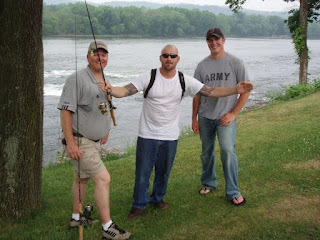 This photo was taken in summer 2003 with my dad and pro skateboarder (and avid angler) Mike Frazier. I added this one because I know Jeff and Juan will know exactly where it was taken. Also, I won the smallie pot that day - $10 richer! Another big part of this decision was getting to know different anglers over time. For example, I remember seeing a completely random post on Facebook about some guy who caught a record spotted bass on a fly rod from a kayak. I thought "wow, that is cool", gave it a like, and kept scrolling. A couple days later I was brainstorming with Ric Burnley of Kayak Angler Magazine about an interview feature and that post came to mind. I eventually found the post again and tracked down Todd West. Todd was super humble and deserving and made for a great interview. We quickly became friends. After we linked up on Facebook, I didn't take long to realize why we had hit it off. Despite one of us being a backwoods Georgia boy and the other a dirty Yankee (Go Sox), we have a lot in common, except I have long hair and he has a long beard. 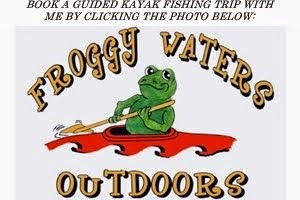 The same goes for many other kayak anglers out there. I already know that you are a good angler. I want to learn more about you. 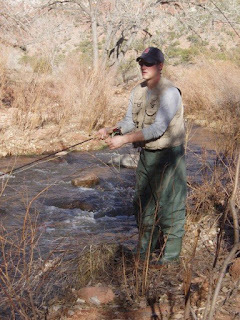 A photo from what I think was my first fishing trip in New Mexico. This was a fairly slow day drifting nymphs on the lower Jemez River. Note that this is a rare picture in which I'm wearing a Boston hat that is not completely washed out. It must have been new. So, take it as a compliment. I don't follow your fishing page because I'd rather learn about you as a person and see the cool stuff you do beyond fishing. My love for fishing runs deep, but its not my only hobby, nor do I want or need to give the impression that all I do is fish and paddle. Like I said, the fishing ALWAYS finds its way to my feed anyway. The ultimate throwback. I always have been a fashion trend setter. I am not sure if this was at Sayers Lake or Raystown Lake. Regardless, it was a sign of things to come. I promise this site will take a turn away from retrospective ramblings and toward actual technical content soon. Winter isn't helping. Until next time, tight lines! Bob Dylan penned a fairly perfect analogy for my current life situation: "Come gather 'round people wherever you roam, and admit that the waters around you have grown. And accept it that soon, you'll be drenched to the bone. If your time to you is worth savin', then you better start swimmin', or you'll sink like a stone; for the times they are a changin'." For much of my teens to mid-twenties, I wanted nothing more than to fish professionally. I thought that would be the pinnacle of happiness. Life led me to kayak fishing, which was a natural progression from most of my early fishing. I immediately fell in love, and I thought that fishing tournaments would propel me to my goals. Through many ups and downs, I found that I was wrong. Despite success, it led to burnout. Although I made many great friends, I burnt some good friendships. Now, ten years later, I still feel guilty over some of the poor decisions I made. I ended up wanting a clean start, and I took a step back to re-evaluate things. That is when the BASS Slam came to fruition and in turn led to writing and other endeavors. I started guiding and realized that I really enjoyed teaching. It was the positive change I needed. Over time, I have drifted further and further from fishing as a profession. Don't get me wrong, I still love fishing, paddling, and even an occasional competition, but my priorities have shifted. I don't want to constantly spam social media, beg for YouTube followers, pay for Instagram friends, create multiple accounts, or any of the other tricks that your favorite social media stars use. Kudos to them - it is a grind, and it takes a lot of time and effort. It is crazy to me that 'influencer" is an actual job title today. Honestly, I find it is best summed up by a term I heard in a hunting podcast. The owner of a fairly major company said that, to put it bluntly, the term "influencer" should be changed to "exploiter". That is not to say that there aren't a lot of people out there doing truly interesting things and genuinely sharing their experiences. I tend to gravitate to those people because I can see their passion, not their passion hidden in dollar signs. Regardless, to all my friends in the industry, know that I will always support you to the best of my ability, and if you are reading this and we aren't (yet) friends, don't hesitate to reach out if you have a question, comment, etc. about anything on this site. 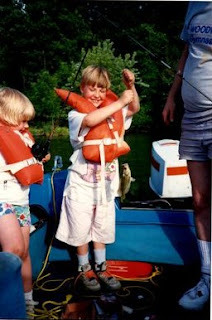 So now, I look at my beautiful family and our amazing life, and at age 35, I have no desire to be a professional angler. Finally, being a kayak fishing "pro" (or at least pseudo pro) is a thing, and I want nothing to do with it. I am cutting back to make life easier and simply share my experiences doing what I love. Hopefully that means more writing, more photos, and a little blonde swimmer in front of me in the Commander 140 this summer. I also spend a lot of time consulting, so to speak, with friends. We talk about baits and the nuances of different designs, scout for tournaments, discuss and break down new water bodies, debate rod design, plan guide trips and tackle a host of other topics. It is rare that I don't end these conversations smiling. Part of me thinks "if I only knew then what I know now", but I think this was a lesson I needed to learn the hard way. Maybe in another ten years, my priorities will shift again, and if the right project popped up, maybe I couldn't say no. My main focus going forward will be with the Wilderness Systems team. I wish there was less turnover at times, but the team has become a great group. Rarely do I have a conversation with another Wildy team member that doesn't start by asking about life and family. Fishing follows. That is the way it should be. So, if you see this site or my social media patterns shift, that is why. I only have so much time and energy to give, and it needs to be invested wisely. I hope these early morning coffee blogs become a regular thing this year. I certainly have a lot of blog topics to catch up on. Until next time, tight lines! Wow. I didn't blog at all in 2018. I guess the times are changing. It's odd because I miss writing, but I often find myself struggling to muster the energy and focus that it takes to put together a well-written blog or article. Clearly, I am not alone, as many blogs (and magazines) are trending in the same direction as MPF. A never-ending to do list, an infant and toddler at home, homestead chores and about a million projects have slowed my roll a bit this year. Who knows, maybe I will pick it back up in 2019, but I'm not going to call it a resolution just yet. Maybe I should shift to shorter posts that don't take as long to write. The problem is that I am detail-oriented person, so I have a hard time leaving out the little stuff. Regardless, I have decided to throw together a recap post of 2018, and it will be fairly long and picture heavy. Both in the outdoors and at home, I had an amazing year filled with ups, downs, and many lessons learned. I hope you enjoy reading about it as much as I enjoyed living it. Cheers to everyone this New Year's Day. In January, we finally finished renovations on the house and moved in. It took almost a year to clean the place out, do some demolition work, and make a bunch of upgrades and aesthetic changes throughout the house. 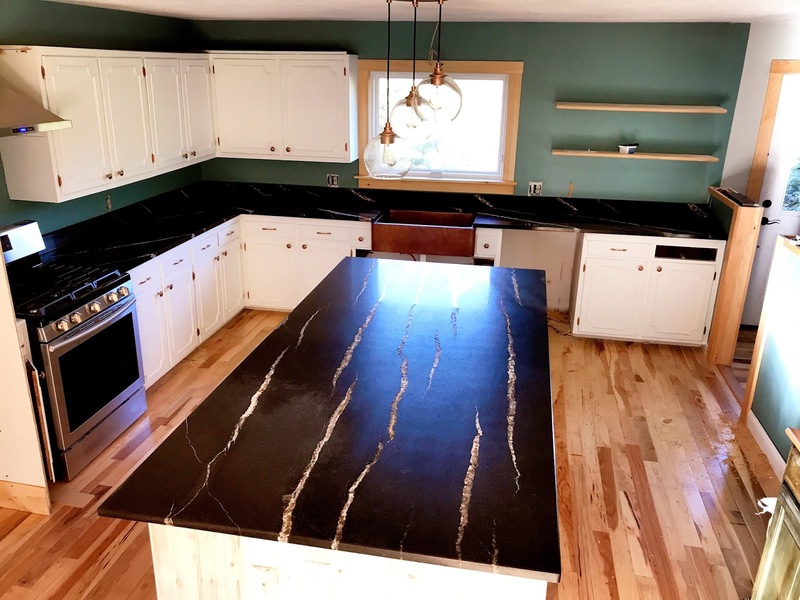 Think 70's green shag carpet, white walls with dark trim in every room, fake brick linoleum, salmon-colored Formica countertops, faux yellow burlap uppers, and many, many more changes. The pictures below show the kitchen a couple weeks after we started demolition and a few weeks before it was completely finished. The upstairs is still a work in progress, but the downstairs is looking great. People always tend to migrate to the kitchen. However, I think the wood stove has become the center of the home. 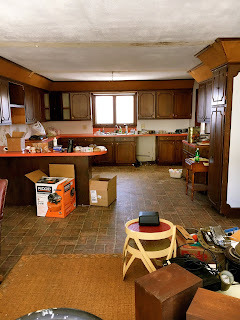 A shot of the kitchen about two weeks after we started demo. We had removed the old appliances, faux beams, and some other things when this photo was taken. In February, we found out that the baby on the way was a girl. We were thrilled! On June 7th, Petra Charlise made her appearance. My wife was a champ as she suffered through a long labor. Now, we have a chubby, happy little 7-month old who is absolutely amazing, albeit not the greatest sleeper. A Thanksgiving selfie that Cullen didn't want to be part of. Petra is wearing a dress MM made that also included a top layer (not pictured). Cullen has taken being a big brother in stride. He is becoming more affectionate toward Petra and slowly turning into stereotypical love-hate sibling. In other news, he LOVES cows, horses, dinosaurs, tractors, heavy equipment, and pretty much all things outdoors. The little man also absolutely loves his grandparents. He is one active little dude, and they keep a smile on his face. He also discovered the magic of running through bubbles this past summer. Enough said. It was a long winter. We didn't have local open water until the third week of April, and I finally got to wet a line a couple weeks later. Thankfully, the fish had their feed bags on, and targeting deep points and rocky areas led to a couple dozen fish, with a number of 18"-19" largemouths and smallmouths. I also added to the fleet in April and picked up a Wilderness Systems Commander 140. I've been eyeing one for a couple years and wanted to grab one before they become impossible to find since they are discontinued. I cannot wait to take Cullen out with me in it. I did learn to be careful if you are going to take a boat that sticks out this far on the Taconic Parkway in New York. We ran into a grumpy cop who scolded us onto a different highway, although I'm not entirely convinced his reasoning was correct. Shortly after, turkey season started. I had never really turkey hunted before, at least not more than a day or two here and there, and never on my own. I spent a lot of time practicing with different calls and prepping for the season. In the first week, I feel like I learned 5-6 new things each time I got out. Then, on the first Saturday of the season, I called in and harvested my first bird. He was a jake, but he was a trophy to me. I did a traditional roast turkey wrapped in bacon and made a few quarts of stock and soup with the bones. I'm not sure what it is, but the wild turkey noodle soup has such a unique and delicious taste - amazing! I also had a beautiful Tom come within about 10 yards. Unfortunately the angle was really awkward, and rather than spinning and shooting at the same time, I waited to see if he would eventually give me a clean shot without moving. He never did, but man was that exciting. Cullen was still asleep when I got back with the bird. Now he is up super early most days. A backyard toast to a fine turkey season, including a close encounter with a gorgeous Tom that didn't quite work out. Berkshire Mountain Distillers bourbon in the glass. We also decided to expand the garden this year out to about 3000 square feet if we include the blueberry patch, plus we built and hung new gates. We did a lot of the typical staples for us - a variety of tomatoes, sweet potatoes, Kennebec potatoes, tomatillos, hot peppers, strawberries, green beans, squash, cauliflower, broccoli, melons, herbs, and some other things I am forgetting. I also built two raised beds for the house that were easy to access for a pregnant woman. They were a hit, and better yet, effective. Over the course of the next few months, we worked extremely hard to can, preserve, and freeze as much bounty as possible. By the fall, I had to put up shelves in the basement to create a little pseudo-root cellar. It has been extremely worth it to have home-grown fruits and vegetables at our fingertips this winter. We did some foraging of berries and mushrooms this year too. I didn't get to fish a ton this year, but the trips I had were very successful. One day was a brutal post-spawn morning with bluebird skies and no wind. It made the bite tough, and a lot of fish weren't committing. Finally, I put together a pattern fishing a jig in deep, isolated grass patches and ended up landing 8 bass in the final hour of the day. On another trip to a local lake that has traditionally be tough for me to figure out, I caught around 20 bass fishing deep weed edges, with a few fish in the 18"-20" range. Another BBB Fighting Frog fish pushing 20"
On another trip, I headed to catch some trout early one morning at a local lake. Reports from a number of other anglers were of skunks, but I was lucky enough to land about 20 on spoons and jerkbaits. Cullen gobbled up the fresh rainbow trout fillets. One of the last trips I took this year was with two friends to Salem, MA, to chase stripers. The tides weren't ideal, and the fishing was generally tough, but we landed some fish and had a lot of fun. After the trip, I headed home to attend the wedding of a close friend then grabbed the family and traveled to the RI coast for a week. I even got a quick trip in this year when in NC for work. I met up with two of my favorite Durham County residents for a river float. We caught a lot of fish and had a lot more laughs. I did spend a lot of time on the tractor this year and got to tackle some new mechanical problems. Cullen LOVES helping us with the hay - from the field in the summer to the barnyard in the winter. I ran trail cameras in a couple different areas starting in late July. I probably should have gotten them out sooner, but life had other plans, as usual. I have a love-hate relationship with game cameras. It is easy to rely too much on them instead of going with your gut or reading the sign, but they were definitely a huge help in the early season through mid-November. This year, the mast crops were extremely poor, and the area I prefer to hunt was essentially devoid of beech nuts. I had to change camera locations a few times, then in mid- to late September, I finally found a couple really reliable spots. I was felling great, so I let the cameras roll for the final three weeks before the start of the season without checking them. As I eventually found out, that was a mistake, because the pattern that seemed so solid had changed, and over three weeks on three cameras, I had two pictures of deer - both does. I ended up scrambling for much of the start of archery season before finally honing in on a couple active areas not long before the rut. However, my brother in-law Jason arrowed a gorgeous 8 pointer on the opening day of the season. I had some deer in range but never saw a deer with antlers with bow in hand. In this part of the state, doe tags are tough to draw (19% chance), but we do get two buck tags. On the first day of shotgun season, my luck changed, and I harvested a gorgeous 9-point buck. As usual, we processed the buck ourselves. I didn't hunt as much after that, but my wife, father-in law, and I got out most Saturdays. We all saw bucks and had a few close calls, but nothing quite fell into place. On the last Saturday of the muzzleloader season, my chance at tagging out finally came. I had two bucks, an 8 pointer and a smaller buck, come within about 10-15 yards of my spot along a brook. However, the hammer on my muzzeloader would not lock into firing position. Frustrated, I eventually had to come back to the house and take the gun apart to fix the issue. That was the last deer I saw before the end of the season. I was really having a tough time processing the encounter and missing my first ever chance to tag out, but for whatever reason, it wasn't meant to be. This year I realized how much I love hunting the big woods. It isn't quite as wide open here as it is further north in Maine and other various parts of New England, but I realized that my heart lies in exploring the woods, even if I know that isn't the most likely way to harvest a deer in most cases. Just before Christmas, I finished the Euro mount of my buck to hang above the stove. I also have to brag on my wife a little before I wrap up this blog. She decided this fall that she wanted to start sewing. She had never done it before, but within a few weeks, she was churning out gorgeous horses and even dresses for Petra. She blows my mind with her devotion to our kids and effort that she puts in to keep this family running. Now, it is back to cutting logs, splitting wood, doing some land maintenance, and crossing some projects off the list. My favorite workout partners are now Husqvarna and Fiskars. Those Scandinavians can really bring the heat. Sorry - dad joke. I also got to tackle a bunch of fun projects around the house and on the farm, including hanging gates, restacking stone walls, running fence, driving posts, building a headboard, and doing some floating shelves, among other things. The floating shelf I made for the TV. Almost a year later, it still needs some finishing work for the cords. The massive barn wood coat rack I made for the mud room. MM deemed it Pinterest worthy! One of the many stone walls not too far from home. I restacked some of this one this fall. In looking back through photos to include in this blog, I realized what an incredible year it was. I feel like this post only scratches the surface of everything that happened, and of course, there were a lot of tough moments that made all the good stuff all the more worth it. Thanks for reading, and happy New Year!